Overview: My Budget Book is not just an ordinary expense management program. 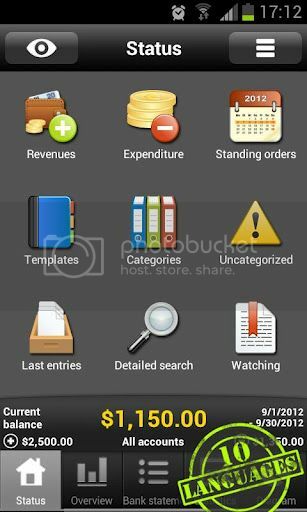 This app helps you keep track of you expenditures and earnings and manage your money more effectively. Transactions and templates can now be copied via the context menu. Transactions can now be used as a template via the context menu. The main category will be displayed in addition to the transaction, if it is a sub-category. All your expenses at a glance. ✔ Easy access. No internet connection required. ✔ Available in 10 languages (The language is currently selected via your phone settings): English, Deutsch, Español, Português, Français, Italiano, Nederlands, Pусский, Polski, Magyar. ✔ See this month’s balance when the app starts up. ✔ The graphical overview is perfect for planning your expenses over the upcoming of months. ✔ Customize the overview by changing the number of past and future months that are displayed. ✔ Manage more than one account. ✔ Record you earnings and expenses across all accounts. ✔ Get more flexibility by selecting what day you want the month to start on. ✔ Visualise the statistics as a table or graph and see where your money has gone by categorising all earnings and expenses. ✔ Filter your earnings and expenses according to months, quarters or whole years, as well as any other criteria. ✔ Sort your transactions by date, amount, title or category. ✔ Use the powerful search function to look for specific expenses and/or time periods. ✔ Carry your balance over into the next month. ✔ Manage standing orders so you can plan ahead for the upcoming months. ✔ Create templates to make inputting your expenses is even easier. ✔ Add further main and sub-categories to get a better overview of your expenses. ✔ Use the watchlist to monitor important transactions. ✔ Use the built-in calculator to quickly calculate amounts. ✔ Protect your data by activating password protection. ✔ Export your data in HTML or CSV Format (on SD card). ✔ Create backups so you never lose your data. Now also with automatic backup feature. ✔ Import your existing data using the CSV import function (Just move the CSV file to the folder “SDCard/My Budget Book” and import it via the app settings (Import of other formats will be made available by request). ✔ 3 Widgets. NOTE: If you move the app to SD card, you can not use widgets. This is due to the Android system and it can not be changed. To use the app as a single user on different devices or to add automatic backups to DropBox, it is recommended that you use a synchronization app such as Dropsync or FolderSync. For more information, please read the chapter “Synchronization” in the integrated guide. 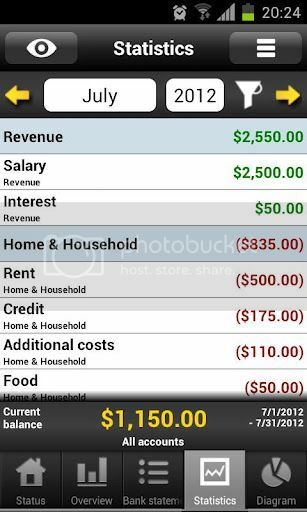 The post My Budget Book 3.1 (Android) appeared first on Megandroids.